Student-athletes must meet the provisions of eligibility as prescribed by both the University and the NCAA. The following information outlines the policies, processes, and systems in place to determine the eligibility of athletes to represent the University in NCAA or ACC competition. All student-athletes must meet the academic eligibility policies in place at the time of the student’s first term of enrollment. Academic eligibility policies in force at the time of a student’s first enrollment are represented in the University Catalog. In addition to meeting University academic eligibility policies, student-athletes must comply with policies governed by the NCAA Division I Constitution Operating Bylaws and Administrative Bylaws. (The details of the NCAA eligibility rules are contained in the NCAA Division I Constitution Operating Bylaws and Administrative Bylaws Manual that is published annually). Student-athletes who entered after August 1, 2003 and who have completed at least one academic year in residence or utilized one season of eligibility in a sport will be computed based on the guidelines indicated below. Student-athletes who first entered college prior to August 1, 2003 are subject to slightly different rules and should refer to staff in the Athletics Office for specific requirements. UNC’s Athletic Compliance Office and the Office of the University Registrar work together in applying the NCAA eligibility rules and monitor student-athlete compliance. All student-athletes must pass a minimum of 6 degree-applicable hours each academic term in which they are enrolled full-time (not including summer terms) to be eligible the following term. All student-athletes must pass a minimum of 18 degree-applicable hours since the beginning of the previous fall term or since the beginning of the University’s preceding regular two semesters (not including summer terms). All student-athletes must pass a minimum of 24 degree applicable hours prior to the beginning of the students 3rd term, including summer sessions. All students must declare an official major offered by the University beginning with their fifth full time term. Courses taken in summer school following the regular academic year may be used in computing the progress towards degree requirement. Courses that are taken prior to initial full time enrollment may be used to fulfill the 24 hour requirement.Courses taken in summer school other than at UNC-CH must be evaluated and accepted by the Undergraduate Admissions Office as academic degree credit at this institution. These courses must be approved by Undergraduate Admissions prior to enrollment at another institution. In order to include credit hours as a part of progress toward degree requirements, the hours must be recorded in a term prior to the semester for which the certification is effective. Credit hours for regular courses will be counted in the term in which the course was taken regardless of when the final grade is reported. All student-athletes are required to declare a major by the beginning of the third year (fifth semester). From that point, calculations of credit hours to determine eligibility will be based upon credit hours earned for degree credit in the students’ specific major which count towards the student’s specific baccalaureate degree program. NOTE: Any exceptions to the NCAA Eligibility compliance rules and regulations indicated above, or questions concerning the interpretation of ACC or NCAA rules should be resolved and directed as shown in “Interpretation of ACC or NCAA Rules”. Paper records (academic worksheets, check sheets, waivers and other special documentation pertaining to a student’s eligibility status) related to the certification of student-athletes will be maintained in current hard copy files, by sport, until the athlete has exhausted eligibility or is no longer competing in athletic competition. All paper documentation on previously competing athletes is then imaged to student files and retained in the University Registrar’s record storage system. Certification documentation connected to student files follow the retention and disposition schedule of “Student Folders File”, currently held for 10 years from the student’s initial enrollment. (Retention of these records exceeds the ACC recommendation that all certification records be kept for at least seven years from initial enrollment). The Declaration of Eligibility Rosters approved and signed by the University Registrar are maintained separately and retained permanently. In addition to paper documentation, effective with the creation of the University Registrar’s NCAA eligibility tracking database in fall 2005, all electronic information on athlete’s statuses are maintained in perpetuity. Meetings will be scheduled with the members of the Compliance Office and the University Registrar’s office to review internal processes, receive additional training on various athletic and academic rules and regulations of either the NCAA or UNC, or to review any issues pertaining to particular athletes. This will include a review at least twice a year of each individual athlete to ensure consistency in the calculation of hours and the evaluation of the academic worksheet. The Academic Support Staff will be included in these meetings as necessary. 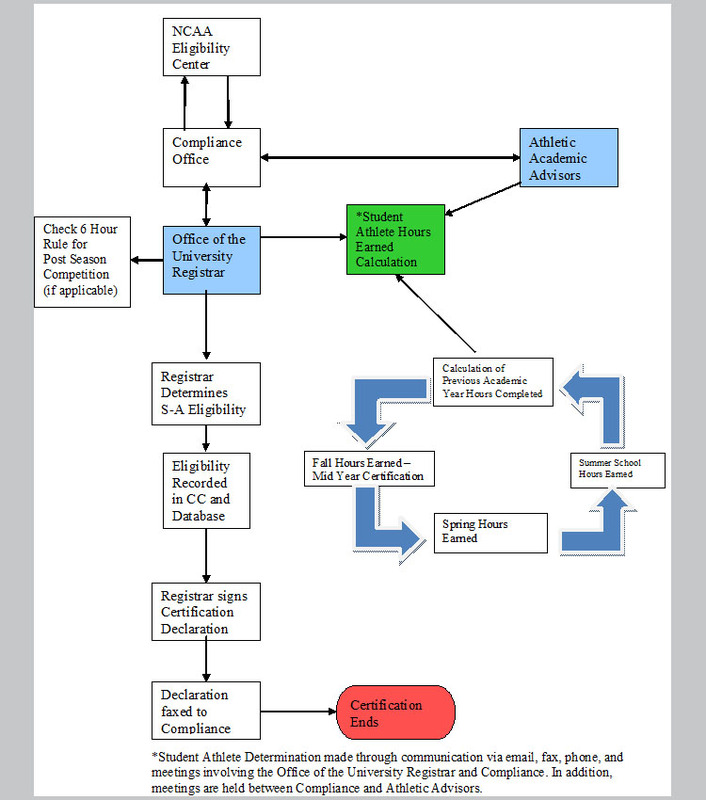 During the eligibility certification process, questions concerning the interpretation of ACC or NCAA rules should be submitted in writing to the Compliance Office within the Department of Athletics, specifically the Assistant Athletics Director for Certification and Eligibility or the Assistant Director of Compliance. The Compliance Staff will promptly respond to the inquiry in writing. When further review is necessary, the Compliance Staff will forward the request to the conference ACC or NCAA office for an official interpretation. The Compliance Staff will receive the interpretation in writing and will forward the information to the appropriate parties involved within the University. The Chancellor is responsible for approving the procedures for certifying the eligibility of an institution’s student-athletes under NCAA legislation. The Chancellor has designated the Director of Athletics as the individual responsible for the institution’s rules compliance, and the Director of Athletics has assigned oversight of the compliance program to the Senior Associate Athletics Director. The staff of the Senior Associate Athletics Director works in concert with the staff in the University Registrar’s Office to monitor compliance and certify athletes. As the Certifying Officer, the University Registrar is responsible for approving and signing the “Eligibility Declaration” to certify that student athletes meet the Institutional, Conference, and NCAA requirements for eligibility. Certification of eligibility must occur prior to allowing a student-athlete to represent the institution in intercollegiate competition (see Bylaw 14.10.1).